Let’s discuss all the steps that go into addressing your envelopes. I’ll admit, this was probably the most difficult part of wedding planning for me. First, it’s narrowing down the guest list to a reasonable number. Then, you have to track your guests down for their addresses. And don’t forget about those who have recently moved or who just got married and are now a “Mr. and Mrs.”! 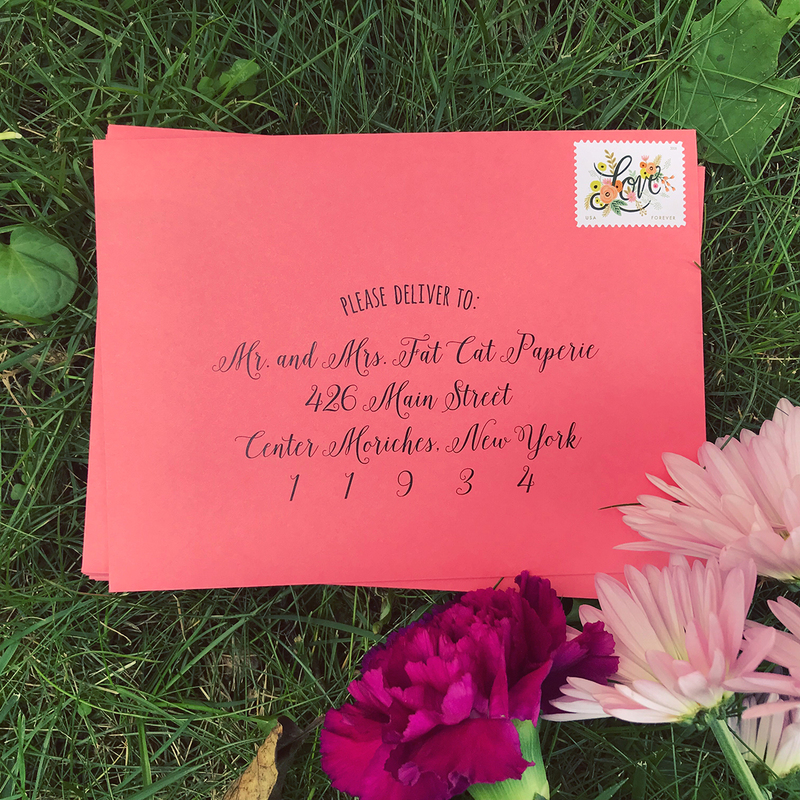 We can’t exactly tell you who to invite to your wedding or force your second cousin to fork over his new address, but we can help you with any odd addressing etiquette questions. • Try to avoid addressing your envelopes with “and guest” when possible. The invitation feels much more personal if you’re able to track down the guest’s name. • Make sure to spell out words like “Street” and “Avenue” as well as the state for U.S. addresses. Note, if you’re planning to address your inner envelopes as well, the rules change a bit. 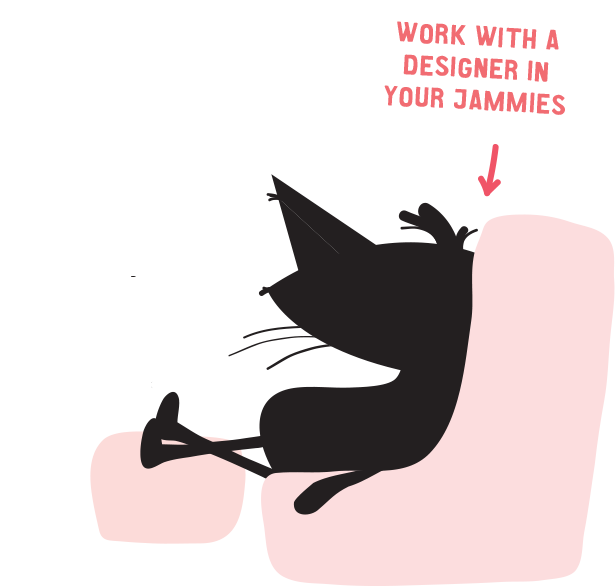 If you’re a Fat Cat client, feel free to call or email us and we’ll gladly walk you through the differences. It’s the most expensive of the options but for good reason. A skilled calligrapher carefully crafts each address by hand. We work with many local calligraphers each with their own unique style. Let us know if you’re looking for modern, traditional or whimsical and we’ll pair your envelopes with the best gal for the job. Our most popular option! 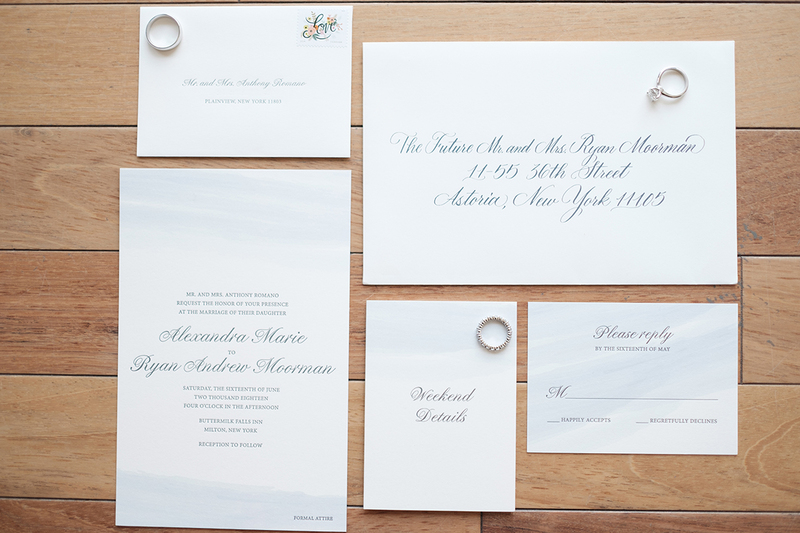 In this case, we’ll match the font on your invitation and print each address on the envelope using one of our printers. This is also the quickest so if time is of the essence let us know and we’ll have these ready for you in a flash. Sidenote, it may be tempting to try this at home, but I promise it’s not worth the headache. Envelopes can be extremely temperamental. They typically smudge, crease or rip when fed through a standard desktop printer. 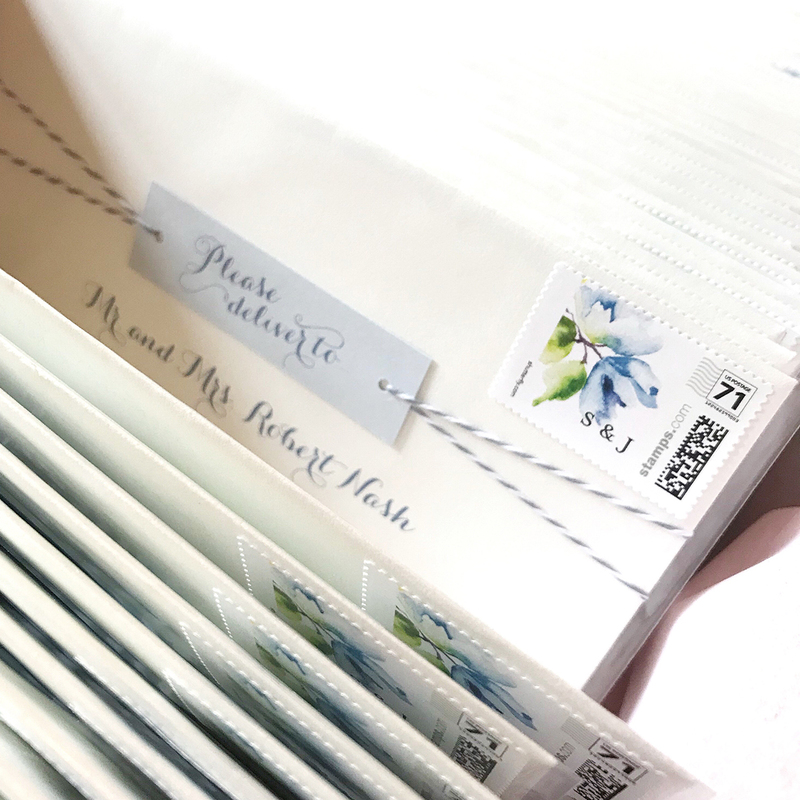 If you or a generous family member have nice handwriting, addressing your envelopes by hand can add nice personal touch. Allow for extra time if you decide to go this route. Your hand will most likely get tired after 10–15 envelopes so set aside some time to write a few every night until the job is done. Are you a Fat Cat client? Go ahead and ask us as many etiquette questions as necessary. Nothing is too weird — trust me, we’ve heard just about everything. Our entire team is well versed in addressing etiquette and we’re always happy to help! Not part of the Fat Cat family yet? Join us! Over-scheduled? Live out of town? Just don’t feel like changing out of your sweatpants to attend another wedding appointment? WE GET IT. We offer video consultations to make your life easier. And, it’s also a great way to work with a bunch of key family members who can’t be in the same place at the same time. Fat Cat Paperie • Long Island, New York • (631) 657-5481 © 2015 Fat Cat Graphics, inc. • All rights reserved.